This elastic waist pant with drawstring features welt tab side seam pockets, cargo/cell pocket combo and a back pocket. 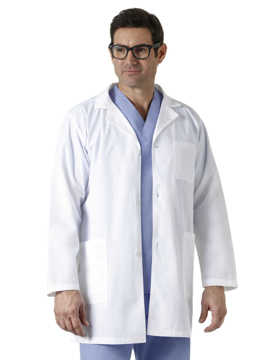 It offers a slightly slimmer fit throughout the leg. Regular inseam: 31". Petite inseam: 28". Tall inseam: 33". This unisex cargo pant features five pockets (including one back pocket and one WonderWink signature cargo pocket with hidden mesh pocket), convertible drawstring (placement allows drawstring to be tucked inside the pant or displayed outside of it), and signature ID bungee loop. Regular inseam: 31. Petite inseam: 28½". Tall inseam: 33". This y-neck mock wrap top features five pockets total (two lower pockets including one WonderWink signature triple pocket with a hidden mesh pocket), signature ID bungee loop, and invisible three part accessory loop. Center back length: 26¼". 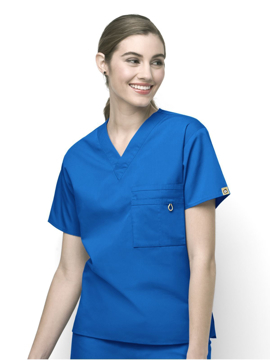 This mock wrap top features two large front patch pockets, one WonderWink signature pocket, Isignature ID bungee loop, and invisible three part accessory loop, front mock belt with bust darts, and sporty stitching at neckline and pockets. Center back length: 27¾". This zip front top features two lower pockets including one WonderWink signature triple pocket with hidden mesh pocket, front and back princess seams, dyed-to-match front zipper with rubber zipper pull, and side vents. Center back length: 27¾". This straight leg fashion utility pant features seven pockets, dyed-to-match full drawstring with easy elastic at waist, double-stitched knee and side seams, belt loops at waist, and bottom vents. Regular inseam: 31. Petite inseam: 28½". Tall inseam: 33". This y-neck mock wrap top features color block styling, five pockets total (two lower pockets including one WonderWink signature triple pocket with a hidden mesh pocket), signature ID bungee loop, and invisible three part accessory loop. Center back length: 26¼". This straight leg pant with drawstring waistband, back elastic, two cargo pockets (including a double pocket with hidden mesh cell pocket), and logo with yellow bungee. Regular inseam: 31. Petite inseam: 28½". Tall inseam: 33". This boot cut cargo pant features a full elastic waistband, inside yellow drawstring, contour waist, three pocket cargo with inner utility tape, two front pockets, one peek-a-boo yellow mesh pocket, bungee loop, double-need tonal stitching, and elongating seam lines at front and back. Regular inseam: 31". Petite inseam: 28½". This curved v-neck top features dropped shoulder and front yoke detail, princess seaming, WonderWink signature pocket with bungee, inner utility tape at front pocket, back yoke, vertical seaming at back with release pleat detail, double-needle tonal stitching, and side vents at hem. Center back length: 30". This decorative v-neck top features a deep v-neck styling with stitch detailing inset, forward shoulder with shoulder tab, longer sleeve length, front and back princess seaming, WonderWink signature triple-pocket with bungee and pen slot, invisible three party accessory loop, inner fit feature, and side vents at hem. Center back length: 30".